The benefit of having a 103-degree fever this week was that I had the time while lying in bed to watch Gravity, which turned into an unexpected treat. 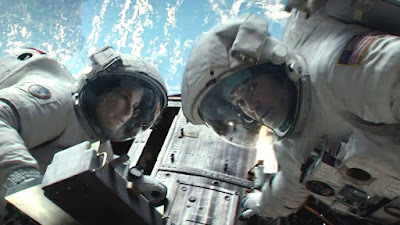 It's as if 2001: A Space Odyssey all of a sudden had interesting, deep characters in the form of the almost-always-great Sandra Bullock and George Clooney. They get caught up in a debris cloud that results from Russian missile strikes on a satellite and their NASA Explorer mission in space goes horribly wrong. Going Clear: Scientology and the Prison of Belief and Sinatra: All or Nothing At All are also two HBO documentaries worth watching. The Scientology movie seems like it could have been a little better, but the weird cult-like sect remains riveting as always (**** out of ***** stars). The Sinatra flick is best when it covers the Reprise and Rat Pack years (**** out of ***** stars).